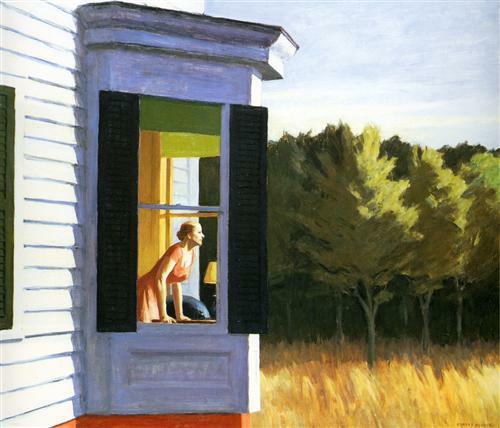 Edward Hopper (1882-1967) was raised in New York State, not very far from where I grew up, although, I hasten to add, much before my time. An introvert, almost a recluse, he chose to paint houses, women and urban scenes typical of the east coast of America: stark white clapboard, contrasting shutters, glaring sun; and at night: fluorescence, neon and shadow. He spent his latter summers in Cape Cod. Most of his female figures were modelled on his wife. There is something urgent and sad about his work. His paintings are full of isolation and silence. Very often windows are a key feature of the composition and the viewer observes figures through them (as in Nighthawks, for example). The windows seem to emphasise the sense of separation and self-containment in his work. I can’t say I enjoy it, but it moves me, perhaps particularly because I am reminded of my childhood amongst the trees and lakes of Connecticut, the blazing sun of the seashores, the unremittingly direct and obvious human constructions. Black and white, sun and shadow, nature and man. The only subtlety is in the nuanced emotion evident in the gesture, posture and expression of the figures. When Andrew Motion presented this painting, Cape Cod Morning, in a workshop at the Wenlock Poetry Festival and suggested we use it as a starting point for a poem, I had mixed feelings. I knew it would not be an easy poem. I cannot understand that. There is nothing in the figure of the woman that speaks of ‘just looking’. And certainly she is not thinking of her washing. Whatever she is searching for from her vantage point in front of the large glass is something that has cut her heart, caused her to wake in tears in the middle of the night. Perhaps time and time again. So the artist creates, and the creation goes forth to be appropriated and changed, made different in everyone’s eyes. The painting (poem, sculpture, book etc.) itself becomes a window. Perhaps the creator offers her view on the world from this window, and the viewer/reader sees it. But more often the viewer gazes at the window, expecting to see what the artist saw, and instead sees the reflection of herself. My own poem changed too, until it was no longer really about the painting. of sun on skin and hair. The taste of salt is on my lips. I try not to beckon you back.